Spend more time finding issues and less time documenting them with qTest Explorer, which automatically captures data from exploratory testing sessions. Save time by auto-capturing test execution environment data from manual, session-based & exploratory test sessions. Capture the results of manual, session-based & exploratory testing, and automatically record user interactions on desktop and web applications. Provide your dev teams with thorough steps to reproduce issues and defects found during the exploratory session. Eliminate the need to submit your session steps into your agile ALM tool. qTest Explorer integrates with Jira, Rally and CA Agile Central for automatic updates. qTest Explorer takes screenshots of each issue and logs then in your agile ALM, creating an automatic audit trail and enabling developers to take action faster. qTest Explorer’s capture technology tracks all interactions from the testing session and automatically creates detailed defect documentation. Capture full screen, select screens, and active / scrolling windows, as well as user interactions. Use the Sessions Module to plan all session-based testing and collect exploratory test session data in one central location. Quickly review any planned, running, reviewed or completed test sessions. Annotate, delete and edit screenshots from a single interface. Edit or delete individual screens, and annotate with arrows, notes and a blur tool. Automatically include information such as OS, browser and ADO version, as well as CPU and RAM. Share defect documentation with other team members via tickets or documents. 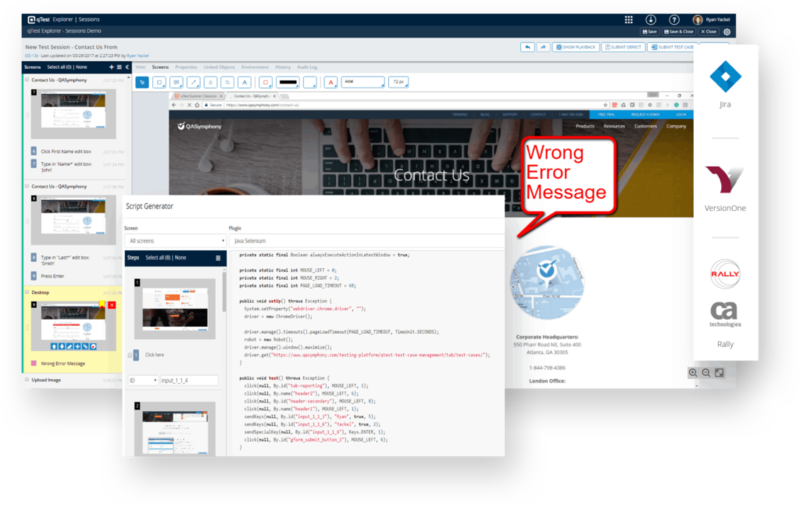 Create new issues and bugs in your agile ALM with a single click, email defects straight from qTest Explorer, or export defects to Word, PDF or JPEG files. Convert session steps into manual test cases that can be stored in qTest Manager. The qTest Explorer automated script generator will allow American Equity to quickly turn our business processes into automated scripts. Its ability to quickly incorporate new testing technologies will allow our automation team to better adapt the changing needs of our organization.